AN ABSOLUTE WATERFRONT private estate on Corfu. THIS LUXURY PROPERTY IS AVAILABLE FOR SALE. 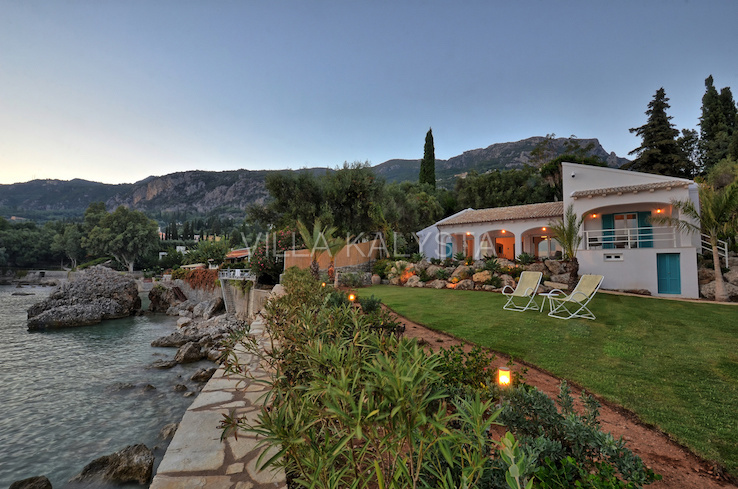 Experience the best of luxury accomodation - perfect for a family or group desiring a private holiday residence right on the beach on the beautiful island of Corfu. The Villa is Spanish hacienda style, with 5 bedrooms and generous indoor and outdoor living area's. It is situated amidst 4,200 m2 of cool gardens and at the clear, blue waters edge of the bay of Paleokastritsa. Ten steps and you are on the beach, with bars and taverna's. We would be pleased to include in your stay with us almost any services you may require to make your holiday a truly magical experience. This could include a chef, babysitting, boating, massage, yoga classes, restaurant bookings, private tours, personal security, etc. Corfu is known as the greenest of all Greek islands, and the lush vegetation complements perfectly the crystal clear blue waters of its shores. The island offers a wealth of things to see and do, or you can just relax in the sun and listen to the gentle surf.